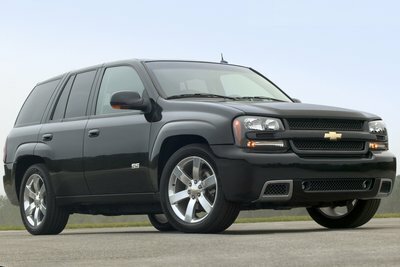 A handsome midsize SUV equipped with a 4.2L inline 6, the aged Trailblazer was Chevy's answer to the once popular Ford Explorer. The sporty Trailblazer SS has a 6.0L V-8 in a 2WD or AWD variants. SS-specific features include a lowered, performance-oriented suspension, unique front and rear fascias, and special interior trim. Stabilitrak(R) vehicle stability control is standard on all Trailblazers. A rear seat DVD video system is also available. The Trailblazer is slowly being phased out in favor of Chevrolet's new crossover the Traverse. The 5.3L V8 engine has been dropped as the Trailblazer is slowly phased out.